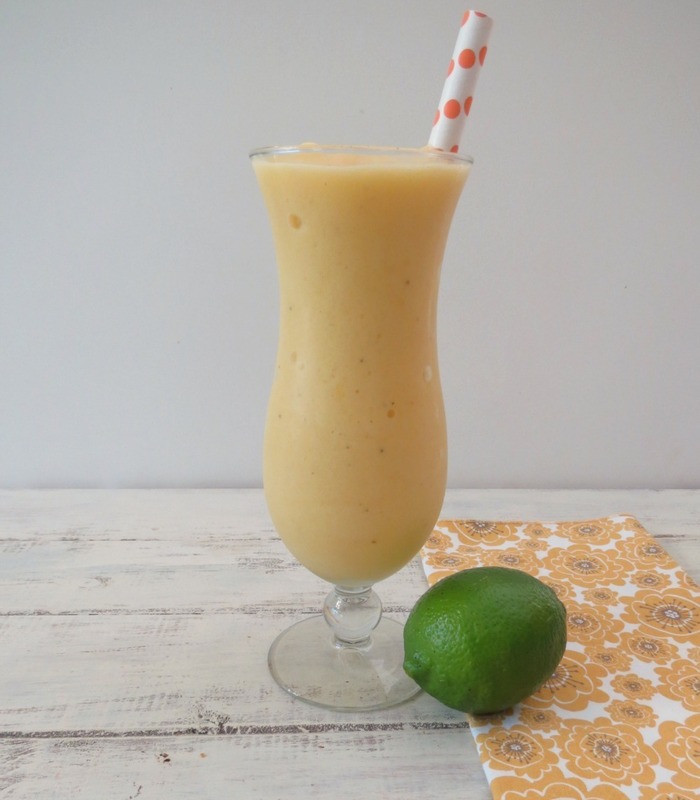 Today, I thought I would kick-start the week with my healthy Cinco De Mayo smoothie!! Ok, I’m not sure if my drink is really considered a Cinco De Mayo drink, maybe more tropical, but still it’s good, it’s fruity and so perfect for a nice sunny day!! 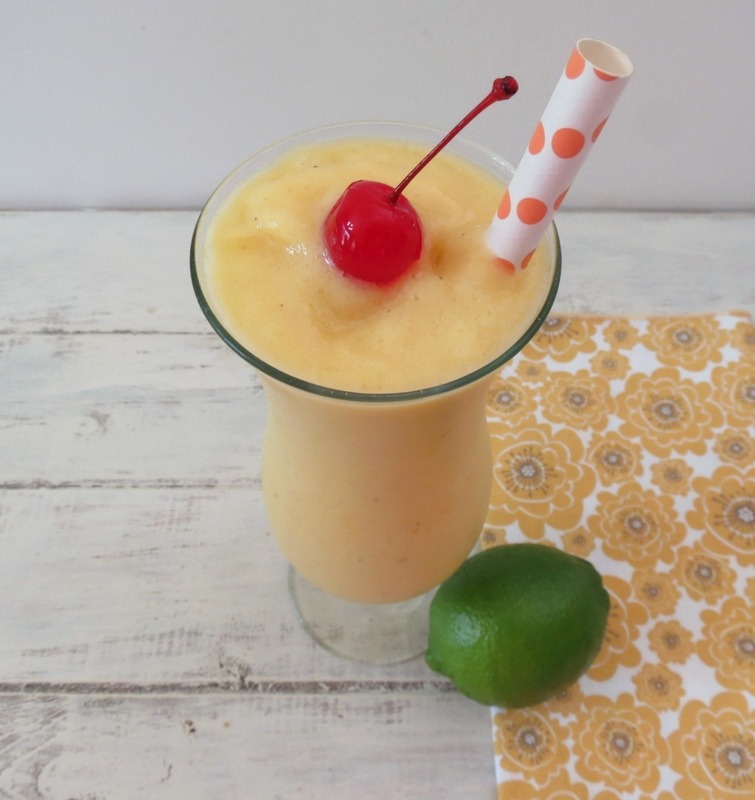 This drink is sure to put you in a summer mood! 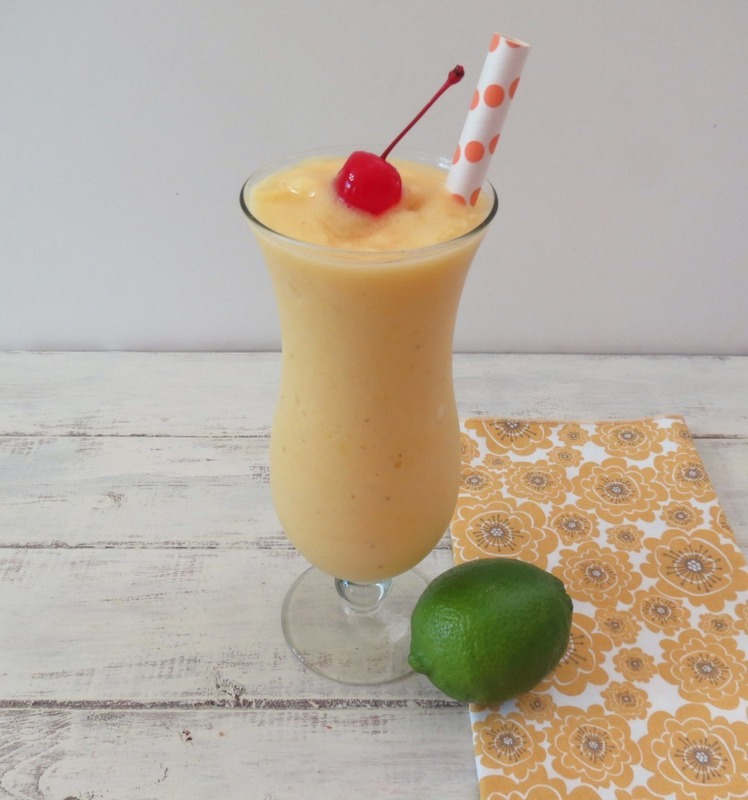 It’s made with pineapple, banana and mango, all blended together in coconut milk. It’s sweet, healthy and loaded vitamin C and sure enough to put a smile on your face!! I know it did mine!! I just love these kind of drinks, they are more like a dessert then a healthy pick-me up to get you through the rest of your day. I made this drink after my Saturday Zumba class. I have to admit I skipped out the past three weeks, and when I went to class, I realized how much I really do like it. Today’s teacher was a good one too, she explained the moves, where as the last teacher just went into routine and never stopped. Yes I know I burn more calories just moving and not stopping, but I do want to figure out how to move right! I am not the most coordinated person when it comes to any kind of dance, so I need instructions. I have to laugh, she played Vanilla Ice’s, Ice, Ice Baby in the class and now that silly song is stuck in my head! Darn that Vanilla Ice. Such a goofy song, I can’t believe it was a hit! 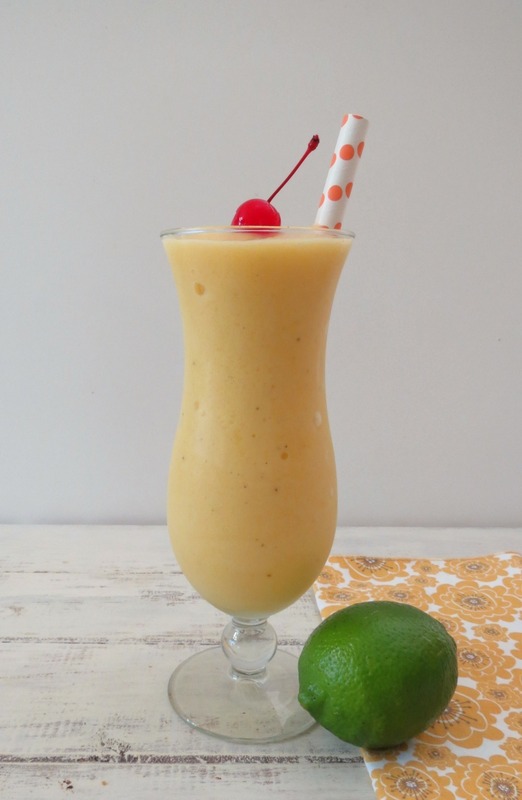 A frozen, healthy tropical smoothie made with banana, mango and pineapple, all blended together with coconut milk. I’m happy to bring back Smoothie Monday, it’s been about two weeks. I was in need of a smoothie!! I have a question for you… Every year I like to go somewhere for vacation and I never get any help deciding from my Husband, so it’s all on me. I don’t have a heck of a lot of money, but I want to go somewhere, any suggestions of what would be a fun place to go that won’t cost a fortune. Normally every August we go to Las Vegas, and I love it there! The weather is hot, the hotels are nice and airfare is pretty cheap, but I tend to spend quite a bit of money playing the slots, Eck… So this year I am debating about somewhere else. I thought Mexico, Los Angeles, Clearwater Florida (I have never been there and airfare and hotels, cost the same as Vegas, but the weather maybe to humid in August) or San Diego. My dream though is Hawaii, but that is a little bit out of my pocket book, so if you have any suggestions, please let me know! Well since I live in San Diego, I’ll tell you to come here! It’s wonderful here but it’s not Cabo or Hawaii 🙂 It has it’s own special vibe of course! This drink you made would be perfect on ANY beach. Loving it! This is my kind of drink! I love this tropical treat! Definitely perfect for a post-zumba snack! We went to Miami last year in August and it was quite humid. Some days were better than others and it actually wasn’t SO bad if you made sure to dip into the water every few hours but then again we are kind of used to the humidity since it’s pretty humid in NYC also! Oh I remember the humidity in Buffalo! I can only imagine it’s probably worse in NYC. My husband would love this smoothie! Not me though because of the coconut. Ooooohhhhh Jamaica! Now your talking a nice vacation. Hmmm, I’ll have to check that out! All my favorite flavors combined. I made a cake recently with all these flavors, so I would imagine this is even better. I saw you on Flour me with love – mix it up mondays link party! Great share! The cake sounds wonderful! Send me the link if you posted it, I need to check it out. I so want one of these right NOW! It looks so refreshing and delicious and healthy all at the same time, you always have something wonderful! Ohhhh, thank you Chris, you are to sweet! 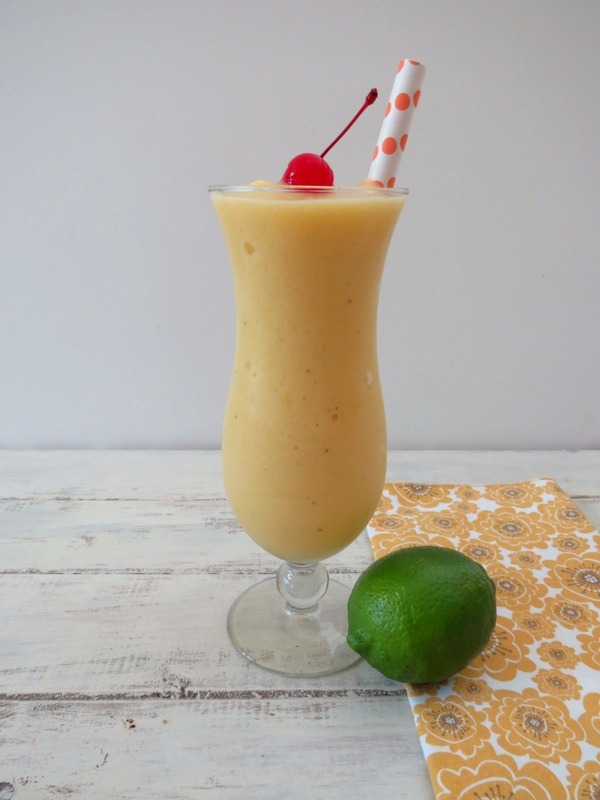 Love this smoothie….such great flavors! Florida is definitely humid in the summer months. I’m slightly biased bc I love Southern California, but San Diego is awesome! A good mix of things to do and see, good restaurants and beaches! Yah, I’m not doing Florida because of the humdity, but I am really thinking San Diego. Thank you! I really enjoy my tropical treats! I LOVE Zumba, but I always hide in the back so people don’t follow my uncoordinated moves! This smoothie looks deeelicious and love that it is dairy-free too! I always get stuck in the middle, there is the same group that sticks to the back of the room, and no matter where I try to hide the teacher always sees me. I think because I look funny! I would NOT last long in Zumba. Your welcome! Let me know how you like it! Recipe sounds very good, but problem with anything coconut (ALLERGIES). What would be a good substitute? Suggestion for vacation: Myrtle Beach, SC.!! As you research Myrtle Beach, look at Ocean Lakes Properties which offers rental beach houses and good amenities!